Our Bansuri, Professional Flute in A, 22" has a mouthpiece that is played in a similar way as the western transverse flute. It is made from a single piece of bamboo with seven holes. The pitch indicated for the bansuri means the flute will play that pitch with the first 3 holes covered. The dominate hand plays the lower three holes. The seventh hole is optional and rarely played. Its main purpose is to give greater accuracy in the upper octaves. It may be played on the rare occasion when you need to play the Ni in the lower octave. 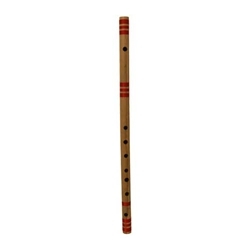 The professional Bansuri flutes are made from only one type of bamboo, called cinchor. This bamboo only grows in the interior forests of Assam. Only straight Bamboo of 3 to 4 years old and of the proper diameter can be used. The cut bamboo is then treated, dried and stored for years until it is properly seasoned. The longer it is seasoned the better the flute. The correct notes are achieved by piercing the seasoned bamboo with hot iron rods in precise positions along the length.